QuiltNSW welcomes you to Day 3 (23 June) of the Sydney Quilt Show 2017 from 9am-4.30pm at the International Convention Centre Sydney at Darling Harbour. On your way into the exhibition area, be sure to stop by the hoop display that showcases a diverse range of techniques and styles. You might even get to meet one of the makers. Pictured below is Salley Govey with hoops by Merelyn Pearce (left), Cathy Jack Coupland (top) and Salley's hoop. And if you can't make the show in person, you can view all of the prize winning quilts in the online gallery. 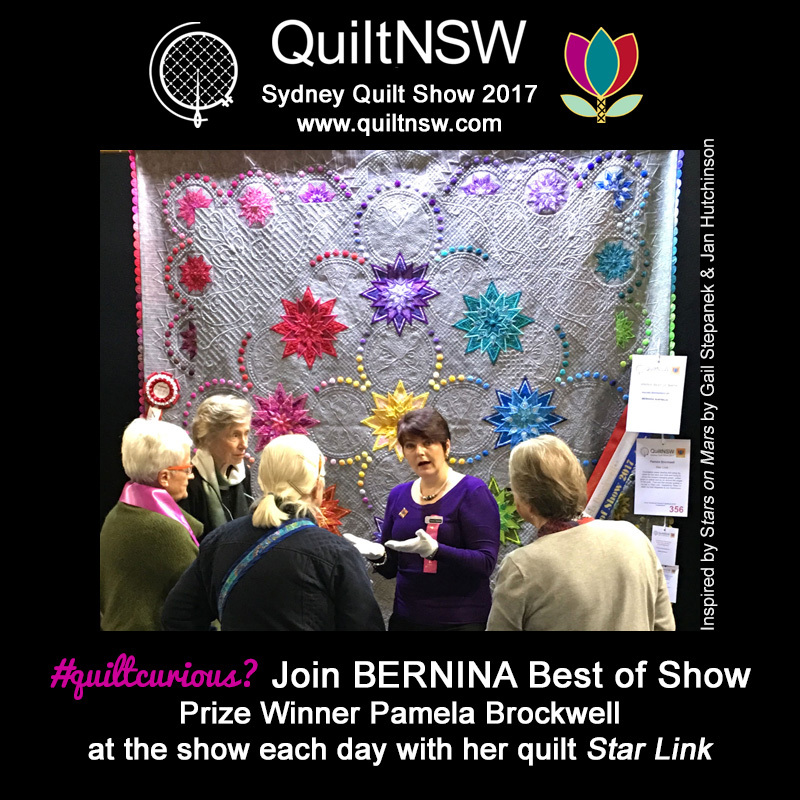 For more information about the quilts, download the Sydney Quilt Show 2017 catalogue (1.8MB PDF) Also download: Sydney Quilt Show 2017 Prize List (PDF). - Buses replace trains between Cronulla and Central and also between Waterfall and Central. - Trains run to a changed timetable between Bondi Junction and Central. For more details see the Sydney Trains website.